Looking for information about Turin weather? Here you will find todays current weather in Turin Italy and the forecast for the next 15 days, together with details of the city's climate - the average high and low temperatures and rainfall - for each month of the year. The daily forecasts for Italy's first capital city and the home of the Shroud of Turin include details of wind direction and speed, the probability of thunderstorms, rain and snow, the maximum hours of daylight, the UV index... and more. And there are hour by hour weather summaries, severe weather predictions... in fact everything to help you plan ahead for your visit. 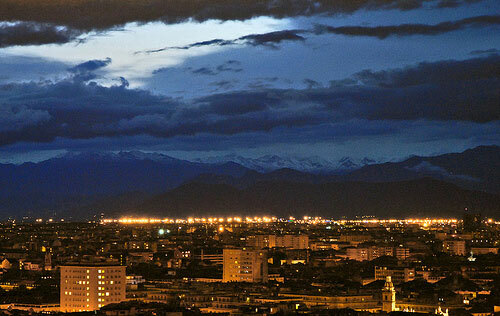 The photograph of Torino above - "Soir d'orage sur Turin" - was taken on a September evening and is used by kind permission of dalbera. If you are planning on visiting Italy again, you will also find the weather forecasts for other Italian cities below and more information about the weather in Italy in general in the main weather page. Why not bookmark it for future reference? For the detailed forecast information for this cosmopolitan city for the next 1 to 5 days, 6 to 10 days, 11 to 15 days, all 15 days, or just the weekends, click on the top right-hand corner "All 15 Days" link. In contrast to the Mediterranean climate of the coast of Italy, Turin lies within a humid sub-tropical climate zone. However, the city's proximity to the mountainous terrain of the Alps also confers upon it variable conditions of continental characteristics. The summers are hot in the plains, but mild in the hills. The winters are cold but dry. Browse all of the best rated Turin accommodation from apartments to bed and breakfast accommodation, hotels and vacation rentals all in one place: more than two hundred places to stay. Quick links from Turin weather to Florence, Milan (Milano), Naples (Napoli), Pisa, Rome (Roma), Siena, Venice (Venezia) and Verona.